Posting about Fontana reminded me that I have been meaning to write about a very nice lunch I had with Harry V, and a few other LTHers, at Meisa, a Bosnian restaurant, which Harry V suggested, on West Irving Park. Difficult to spot in a line of storefronts Meisa is, while still modest, a full scale restaurant, complete with a friendly, interactive owner and efficient service. There were 5 for lunch and we ordered 5 dishes to share. Cevapcici was a nice sized portion of well flavored sausage on a round Bosnian style pita. Served with sour cream, tomato, onion and either spicy, which was not all that spicy, or mild ajvar. Pljeskavica, or Bosnian style hamburger, is the same sausage meat, served on the same bread in patty form. Both were quite good, but I'm a sucker for cevapcici. Spinach burek was nicely baked, flaky and quite good. 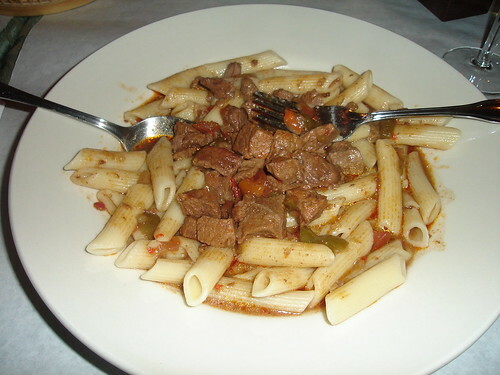 Meisa's goulash was, well, goulash. Good quality meat, rice and a nice size portion. Sarmica, cabbage rolls stuffed with beef, rice and seasonings, were, in and of themselves, quite good, but, to me, the sauce had a slightly odd taste. Not off, simply odd, though I think I was the only one at the table with a mildly negative comment on the sauce flavor. Our waitress Alma, who is the owner as well, didn't seem to mind that we sat and chatted long after finishing lunch. Even restocked our tea, water and bread a time or two. Alma offered she buys cevapcici at Azur Meats, which I intend on trying for our next home cooked cevapcici. Meisa is very inexpensive, our lunch for 5 came to $33. Meisa opens at 7am for breakfast, but, oddly, closes at 7pm. Thanks Harry V for the excellent lunch suggestion, I'm looking forward to a return visit. After lunch I went with Erik M to a Polish grocery deli he knew on West Irving, Szmanski. Szmanski is a quite good Polish grocery/deli with a wide selection of smoked meats, sausage and deli meat. Thanks for the tip Erik. Walking from the car to Szmanski Erik and I could not resist walking into Komis & Antiques, a treasure trove of oddly ornate artwork and collectables. My favorite was an oil painting of a woman in full-on regal dress holding a ferret. Thanks for mentioning this place with your customary thoroughness and grace. Meisa Cafe offers good food made with skill and pride in an area that could use more of the same. I do marvel especially at the quality of the bread there - although it could be that I just enjoy Bosian-style baking. I just can't figure out the closing time of 7:00 pm. How many restaurants stay open all through the long dead period after lunch - but then close just when the dinner rush starts? How many restaurants stay open all through the long dead period after lunch - but then close just when the dinner rush starts? All of them in Bosnia, maybe? Who knows? Having just eaten at another cevapcicitorium which was less good than Meisa, I would second or third the praise for Meisa as a well-run little place that cares and dishes up some good things. I wasn't wild about the cabbage rolls, but everything else was fresh and tasty. If it weren't for the hours, I'd consider this an excellent choice for before the old movies at the Lasalle Bank auditorium. As you know, Wiv, I am not a flash man, but I admit that it did wonders for my cabbage rolls. That sauce looks positively psychedelic. It kinda looks like the Price's™ Pimiento Cheese Spread that I used to buy at Harris Teeter. Joking aside, I enjoyed our lunch, and I have recommended the place to a few of my friends that live in the area. Oh, and step off. I've got the ferret painting on layaway. Erik, as long as the tomatoes are ripe, you will find Price's pimento cheese spread in my fridge. It makes a hell of a burger condiment, too. But I must say that this WI product pales compared to some of the truly local brands I scarfed down last summer in NC. Back to the cevapcici. Lately, I have been running an interesting route down Irving from Ashland to Pulaski, up to Lawrence, then back to Lincoln and back down to Ashland and Irving. I am struck by the Balkanization of this area and the huge number of often nameless little coffee shops and corner delis serving the ever-gregarious and chain smoking Balkan man. A few such places exist east of Fontana, and apparently represent former Yugoslavian states. Possibly the most intriguing spot, however, is the Bulgarian dive, Plovdiv, at Pulaski and Lawrence. Some wild looking parties have spilled onto the street from that space. JeffB wrote: Erik, as long as the tomatoes are ripe, you will find Price's pimento cheese spread in my fridge. It makes a hell of a burger condiment, too. Ask around, Jeff. My homemade pimiento cheese has a bit of a reputation in this community. My love for the stuff is mighty, and, knowing that, C2 even gave me a 312p. book of P.C. recipes. Speaking of N.C. delights, have you ever tried R.O. 's™ Slaw? It goes great with alot of things. The Pimento Cheeseburger is the preferred cheeseburger in the midlands area of South Carolina where I went to college. Most of the better restaurants make their own pimento cheese which they slather on a hot burger and bun causing the chesse to melt into a sloppy goopy mess. It's a tasty sloppy goopy mess. Erik, my folks lived in Charlotte for ten years, during which time I ran accross the slaw you mention. I realize now that I never understood it. Only when I got back to some of my southern roots this summer did I come to remember (or maybe I never knew) the importance of condiments in southern food. Possibly the most ideal example is the West Virginia "sauce bun" -- slaw, ketchup, mustard, "sauce" (not chili, not chutney, not tomato soup, but something special), etc., on a bun with no dog. Erik M. wrote: Ask around, Jeff. My homemade pimiento cheese has a bit of a reputation in this community. The book I gave Erik was a compilation of entries from the Southern Foodways Alliance pimento cheese competition the year before. Last year the competition was on deviled eggs. Two enjoyable and recent visits to Meisa have inspired me to revive this thread. When I'm in the mood for fresh, relatively healthy home cooking at excellent prices in a warm, clean, and very friendly setting, Meisa really fits the bill. 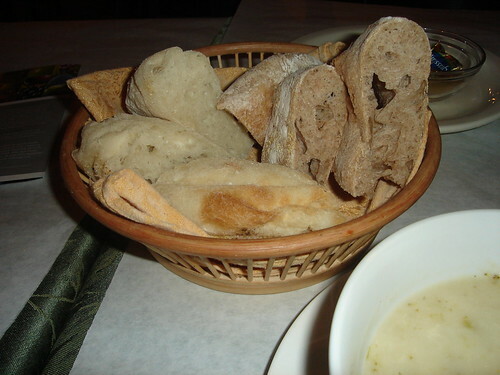 Traditional Bosnian bread is baked daily in house and served warm. It's soft, a little bit chewy, yeasty and delicious. Alma has recently started baking and serving a wheat version, and it too is terrific. I really like the soups at Meisa. 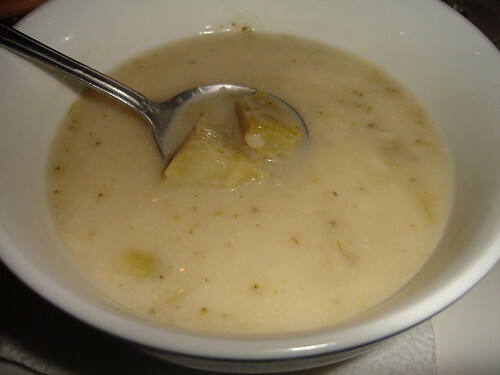 I've tried a few, and while they're usually called "cream of" something, they're light, brothy home-style purees that highlight the essence of the main ingredient, and add just a touch of cream to finish. The broccoli soup is my favorite. While mixed, main dishes are always at least pretty good, and have the consistent quality of being very affordable. I've had an excellent roasted white fish with sauteed vegetables and rice for $8.95, including soup and bread. Stuffed cabbage is also quite good, and I enjoyed the goulash pictured below even though the noodles were a bit overdone. The meat was tender and flavorful, the veggies rounded out the dish, and at under 10 bucks including soup and bread, the price was certainly right. If you order this, go with the rice option instead of the noodles. Dessert at Meisa is worth the trip itself, if you like apple pie in its various forms. 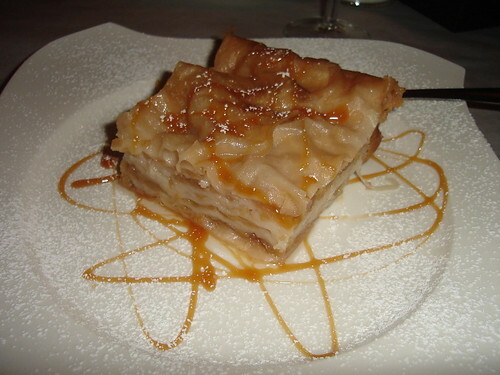 I'm an apple-pie-a-vore, and the version at Meisa is one of my favorites. It reminds me of the noodle kugels I grew up eating: rich, soft, noodley dough baked with tons of butter and fresh, mildly spiced apples. This is true comfort food for me. It may help to note that Meisa has a full bar with some very interesting Bosnian wines and Croatian beers. Give Meisa a shot if you're in the neighborhood or, heck, if you've got a family to serve it may even be worth a bit of a drive at these prices. one more note, as I see references in earlier posts to a 7PM closing time. I did not notice any posted hours, but I was there until 7:30 and could see no sign of them closing shop, so perhaps this has changed since 2005. Best to call ahead if you're going for a late-ish dinner. Hoards of LTHers don't seem to have followed my footsteps here, but maybe now that Great Lake has become tougher to get into, you'll check this place out. Last week's dinner included a perfectly done - crisp and light at the same time - wiener schnitzel. Served with buttered noodles and soup for something like 10 bucks, this was great. Also an excellent cherry cake since they were out of the apple pie, and some interesting bosnian white wine that tasted like a good, dry sherry, and cost $3.50 per huge glass. The fresh, hot, house-baked bread is always the highlight. Driving past Meisa Cafe yesterday, we saw the window signs gone and windows papered over. The telephone number is no longer in service. I have a 2011 Entertainment Coupon Book with a coupon for Meisa, but the phone is disconnected. Does anyone know if this place has returned with a different number? I wish, but no... that location is now a Filipino restaurant. Sorry this is a little late, but being in that area each week for church, I was sad to see the place go a few years back. Recommendations for local alternatives are always welcome, however. You're right, we went by Wednesday and it was Asian...how did they get a coupon in a 2011 entertainment book if they were closed in 2009? Pie Lady wrote: You're right, we went by Wednesday and it was Asian...how did they get a coupon in a 2011 entertainment book if they were closed in 2009? Pie Lady wrote: ...how did they get a coupon in a 2011 entertainment book if they were closed in 2009? How is easy. (They paid for it.) "Why?" seems the better question to me.